If you are visiting London for 7 days then congratulations, you’re going to discover and experience one of the World’s greatest and most exciting Capital’s. In this guide to getting the most out of your 7 days in London you will find a suggested day by day itinerary that will help you to make the most of your time here and to see more of London’s attractions, both the well known and the lesser known ones. So, as Lao Tzu – the founder of Taoism – wisely pointed out, a journey of a thousand miles begins with a single step, then don those comfortable shoes and prepare to take the first of many steps into 2,000 years of history. I know, I know, you’re champing at the bit anxious to get on and get out exploring the streets of London. But, as all great marathon runners know, you get the best results by pacing yourself, so its advisable to take it easy on your first day and explore London at a gentle and leisurely pace. So why not spend day one of your visit getting your bearings and orientating yourself with London? Now, at first glance, this itinerary for the first of your 7 days in London might not seem that relaxed. But it can be done at a gentle stroll and there are plenty of rest spots and coffee shops along the route to sustain you. A good place to begin your exploration of London is Parliament Square. Here you are surrounded by two of the country’s major sights, The Houses of Parliament and Westminster Abbey. Perhaps the most famous landmark in this vicinity is the Clock Tower, better known as Big Ben or, to give it its correct and latest name, the Elizabeth Tower – the name was changed in June 2012 in honour of the Diamond Jubilee of Queen Elizabeth 11. Big Ben is, in fact, the name of the bell that chimes the hour from the tower (there you go, a bit of rhyming to get your first day in London off to a poetic start! ), so you can’t actually see Big Ben, you can only hear it. Big Ben is part of the New Palace of Westminster, better known as the Houses of Parliament, the seat of this country’s democratically elected Parliament. The section immediately to the right of Big Ben, as you face it from Parliament Square, is the House of Commons; the large Gothic looking building (the one with all the pointy bits on top) is Westminster Hall, which, at 900 years old, is the oldest building in the complex; and the building to the right of that is the House of Lords. Now it’s time for that single first step. Cross, cautiously over the road towards the Houses of Parliament and head to the left of Big Ben. Keep ahead onto Westminster Bridge and enjoy your first glimpse of the River Thames. Looking east you will see, on the opposite side of the Thames, The London Eye, the world’s largest observation wheel, which you’ll be visiting on day two (or, if you can’t wait, head over there now). On the other side of the bridge, turn left down the stairs and begin walking along the riverside walk way. You’ll get one of the best views possible of the Houses of Parliament on the opposite side of the River Thames. So get that camera out and start snapping! As you approach the next bridge (Lambeth Bridge) you’ll see a red brick gateway across the road to your left. This is the entrance to Lambeth Palace the London home of the Arch-Bishop of Canterbury, this country’s Chief Prelate. Cross over Lambeth Bridge and go right on its other side. You might like to cut through the gardens immediately to your right. Either way your heading back towards the Houses of Parliament and the large tower with the flag fluttering over it. This, the tower not the flag, is the Victoria Tower which, at a height of 98.5 metres (325 feet), was, for many years, the tallest and largest stone square tower in the world. When you arrive at the Victoria Tower pause outside it. The lower section contains the Sovereign’s entrance and it is through here that the Queen enters whenever she comes to , usually for the State Opening of Parliament. Walk to the next pedestrian crossing and go over the main road, turning right on the opposite side. The building to your left is the Henry V11 Chapel, one of the true glories of Westminster Abbey. Go left along the path that runs between the Abbey, to your left, and the church of St Margaret’s Westminster – the parish church for the Houses of Parliament – to your right. A little further along, on the left, is the main visitors entrance to Westminster Abbey. The Abbey is the Nation’s Coronation Church, and almost every English King and Queen has been crowned inside it since the Coronation of William 1st on Christmas Day 1066. Many of them were also married here, and a fair few of them are buried here. It was here that the funeral of Princess Diana took place in 1997 and, on a happier note, it was here on 29th April 2011 that her son, Prince William, married Kate Middleton. If the line isn’t too long, or if you just can’t resist it, you might like to visit the Abbey now, but keep in mind that, to do it justice you will need to allow at least 90 minutes for your visit. Otherwise, turn your back on the entrance and keep ahead along the path, passing the entrance to St Margaret’s Church on your right. Keep ahead out of the gate and go straight over the pedestrian crossing to proceed clockwise around Parliament Square and go left along Parliament Street. Keep ahead and pause alongside the Cenotaph, the white memorial monument in the centre of the road, the Nation’s memorial to the dead of all wars. It is here that the wreath laying ceremony takes place on Remembrance Sunday, the closest Sunday to Armistice Day. As you pass the Cenotaph, Parliament Street ends and Whitehall, the street of Government, begins. Your way is lined now by various government offices. A little further along on the left, sturdy iron gates and armed police officers mark the entrance to Downing Street. 10 Downing Street, which you will see by looking through the gates and to the right -there’ll normally be a policeman standing outside its famous front door – is the home of the Prime Minister who, at the time of writing, is David Cameron. Keep ahead along Whitehall. The rather grand building across the road to your right is the Banqueting House, all that now survives of Whitehall Palace. Above the doorway, set back behind the black gates and railings, is a bust of Charles 1st (1600-1649) commemorating the fact that it was outside this building that he was beheaded on 30th January 1649. Continuing along Whitehall, you will arrive, on the left, at Horse Guards, where you will find two mounted sentries guarding what was once the entrance to the Royal Palaces. You might like to linger here for a time and get your photograph taken alongside the guards on horseback. If you time your arrival for 11am (10am on Sundays),and go through the arch ahead you, can witness the changing of the Horse Guards. Having passed through the arch, cross diagonally right over the large open space of Horse Guards Parade (this is where the Trooping of the Colour ceremony takes place every June). Go right on arrival at the road (the park across the road is St James’s Park) and turn left when you reach The Mall. Cross to its right side and keep ahead. Once over the next road you will pass Clarence House, the London home of Prince Charles and Camilla, Duchess of Cornwall. Keep ahead to the end of the Mall and cross over to stand outside Buckingham Palace, the London home of Queen Elizabeth 11. Having admired the palace for as long as you wish, backtrack all the way along The Mall, pass through Admiralty Arch and keep ahead into Trafalgar Square, at the centre of which is Nelson’s Column. The square and column commemorate England’s greatest sea-faring hero, Admiral Horatio Lord Nelson, whose victory over the forces of Napoleon at the Battle of Trafalgar on the 21st October 1805, made this country safe from invasion for the first time in years. Unfortunately Nelson was killed in the battle and this square plus the column, topped by a statue of the Admiral, were the Nation’s way of remembering him. Well you had a full morning, and done a lot of walking, so its time to rest those feet and enjoy a spot of lunch. The best places to enjoy a reasonably priced filling lunch in London are the city’s pubs. So, from Nelson’s Column, cross over to the black statue of the man on horseback. This is Charles 1st who is looking along Whitehall towards the spot where, if you remember, he was executed in January 1649. Behind the horses hind quarters you will see a plaque on the ground that tells you that distances from London are measured from this spot. From the front of this statue, look over the road, slightly to the left and you will see a line of trees. Cross over to them and head along Northumberland Avenue where, half way along on the left, you will come to the Sherlock Holmes Pub. This is an excellent, though crowded, spot to enjoy lunch. In the upstairs restaurant they even have an exact replica of Holmes and Watson’s sitting room at 221B Baker Street. From the Sherlock Holmes Pub, go left along Craven Passage, cross over Craven Street, and keep ahead through The Arches Shopping area. On the other side go left up Villiers Street and, at the top, go right along Strand. Cross to its left side and, just outside the Adelphi Theatre stop at the bus stop and await the arrival of a number 15 bus. St Clement Danes Church and the Royal Courts of Justice. Once one arrives, board and get as close to the front of the upper deck as possible. The bus will head along Strand. Having passed through the second set of traffic lights, you will see a church in the centre of the road. This is the church of St Clement Danes. Opposite the church you will see a huge building that looks like a cathedral. This is in fact the Royal Courts of Justice, where the Civil Courts and the Appeal Courts are based. A little further on, the bus will pass a monument in the centre of the road. This is Temple Bar and, as you pass it, Strand ends and Fleet Street begins. But also, it is as you pass Temple Bar that the City of Westminster (where you’ve spent your day so far) ends and the City of London begins. The City of London is the oldest part of Greater London and was founded by the Romans in the wake of their invasion of this country in the year AD43. In around the year 200AD they built a protective wall which encircled their settlement for one square mile. To this day it is that Roman wall that, more or less, marks the boundary of the one square mile of the City of London, the financial heart that houses the important institutions, such as the Bank of England and the Stock Exchange. As the bus passes through the next set of traffic lights you will see a black and white timbered building to the right. This is Prince Henry’s Room, dating from 1610 and named for Prince Henry, the eldest son of King James 1st who, but for his untimely death at the age of 18, would have been King of England following his father’s death. You are now heading along Fleet Street which, until the 1980′s was where all the major national newspapers were based and printed. However, following a series of crippling strikes in the 1970′s, the likes of Rupert Murdoch moved out and the former newspaper buildings are now occupied by financial companies. Having passed through two sets of traffic lights, the bus will ascend Ludgate Hill, at which point ring the bell (you have to do this to inform the driver that you wish to alight) and get off at the next stop. Walk up Ludgate Hill and pause to take in the magnificent west front of St Paul’s Cathedral. You can, if you wish, break from the tour at this point and go inside the Cathedral, albeit keep in mind that you’ll need to allow a good 60 to 90 minutes to get the most out of your visit. Proceed to the left of St Paul’s Cathedral, passing on the left the original Temple Bar, which used to mark the boundary of the City of London before the current monument passed earlier. There is a full history on the information board in front of it. Keep ahead, cross over the next road and enter the shopping mall. This is One New Change, nicknamed the stealth bomber because of its resemblance to a, errr, a stealth bomber! Once inside, take the lift to the 6th floor, go left out of the elevator, then left and walk to the edge of the viewing platform to enjoy one of London’s most magnificent views. Ahead of you is an uninterrupted view of the dome of St. Paul’s Cathedral. To its left, in the distance, you can see the London Eye, through the centre of which you can see Big Ben. To the immediate left is The Shard. Once you’ve enjoyed as much of the view as you wish to take in, take the lift back to the ground floor, go left, then right in front of Guess. On leaving One New Change, cross over Cheapside towards the Holland and Barrett shop, go right and walk to the next bus stop to await the arrival of a number 25 bus. Once aboard the 25 bus, head up to the top deck and get as close to the front as possible. As the bus passes through the second set of traffic lights look right and you will see a large building with round columns outside it. This is the Mansion House, the home of the Lord Mayor of the City of London. As the bus veers right through the next set of traffic lights you will see a statue of a man on horseback. This is the Duke of Wellington. Beyond him, across the road, is a large building with no windows on its lower floors. This is the Bank of England. Finally, as the bus makes its way along Cornhill, you will pass a statue of a man in a hat standing on a plinth in the centre of the road. Directly after him you will pass on the left a building with columns outside it. This is the Royal Exchange, the origins of which go back to the mid-1500′s when it was founded by Sir Thomas Gresham. When the bus has passed through the next set of traffic light, ring that bell and prepare to alight. When you get off the bus look across the road and you will see a gleaming silver building opposite. Cross over to it. This is the Lloyds Insurance building. Turn right in front of the Lloyds Building and walk along Leadenhall Street to go next left along Whittington Avenue.This will bring you into Leadenhall Market, Victorian London’s most beautiful market, dating from 1881. This might be familiar to Harry Potter fans as it was used as the approach to the Leaky Cauldron in the first two Harry Potter films. Keep ahead through the market, following the road as it bends left then right, and cross over Fenchurch Street to keep ahead along Phillpot Lane, at the end of which cross over Eastcheap and walk along Pudding Lane. At the end of Pudding Lane, on the left, a plaque on the wall marks the spot of the baker’s shop, belonging to Thomas Farynor where the Great Fire of London broke out in 1666. Turning your back on the plaque you will see the Monument to the Great Fire of London, surmounted by a golden ball of flame. If you’re feeling energetic you can climb the 311 steps to the viewing platform for some stunning views across the London skyline. Speaking of stunning views, cross and pass to the right of the Monument. Go left and walk onto London Bridge and walk to its middle. Looking down river you will get an excellent view of Tower Bridge. Backtrack off the bridge and go down the stairs on the right. This will bring you onto the Thames Footpath. Keep ahead, there’ll be a view of The Shard across the river to your right. Keep ahead, passing the old Billingsgate Fish Market on the left, until you arrive at the Tower of London. This imposing fortress was built by William the Conqueror in the wake of his invasion of this country in 1066. It is where the Crown Jewels are kept and is guarded by the famous Beefeaters. You might wish to visit the Tower of London, or you might prefer to leave it for another of your 7 days in London, when you’re not as footsore and can do it justice! Whatever your decision you’ve now got a good idea of the layout of London and, over the next pages we’ll provide you with suggested itineraries of what do do in London during the rest of your stay. So you now have a choice. If time permits, Tower Pier is located on the river just outside the Tower of London. 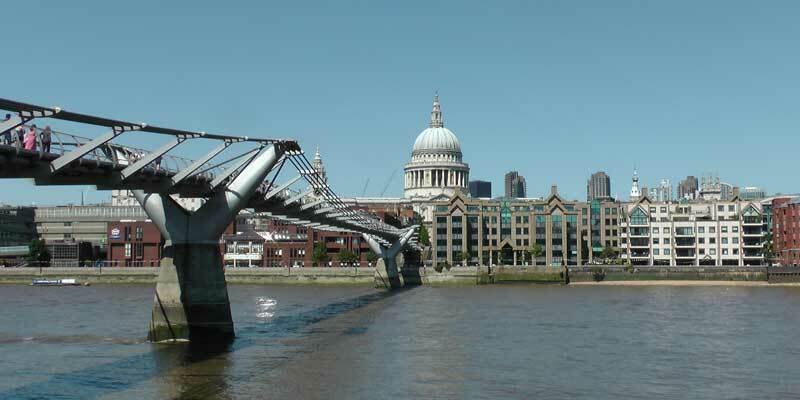 You can take a boat from here to Westminster Pier and then walk the short distance to Westminster Underground Station. Or you can make your way clockwise around the Tower, and then walk through the underpass to arrive at Tower Hill Underground Station. Obviously it’s up to you how you wish to spend the evening of your first day in London. You might like to attend the theatre, although jet lag might be setting in so it might be best to leave this for another night! A nice way to chill out and end your first day in London is to enjoy an evening meal in one of London’s historic pubs. You can choose from our list of London pubs all of which we’re sure you’ll enjoy. So, we’ve reached the end of the first of your 7 days in London and, hopefully, you’ve now got a pretty good idea of the layout of the City and where the major London attractions are in relation to one another. Tomorrow, we’ll focus on more in depth concentrated sightseeing around a specific theme or area. Till the morning, sleep tight! Click here for days two to seven of what to do in London. The full itinerary for the remainder of your 7 days in London. Check out the walks that will be taking place during your time in London. Take a look at our suggestions for things to do in London.